Devon Sillett is a former radio producer, turned writer and reviewer. Born in the US, Devon now calls Australia home. She has loved books as long as she can remember — so much so that she even married her husband Matthew in a library! Currently, she teaches in the writing department at the University of Canberra, where she is also a PhD student, researching Australian children’s picture books. If she isn’t writing or reading, you’ll find her playing Lego or hide-and-seek with her two young sons, Jay and Aaron. 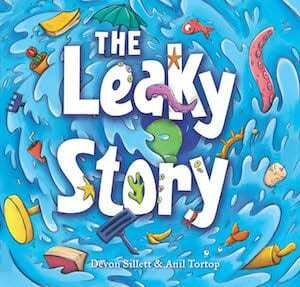 Her first picture book, The Leaky Story, was published by EK in 2017. Book lives at the library and desperately wants to go outside, but is intimidated by all the things that might happen ‘out there’. A page might get torn. Book’s cover might get dirty. Book might never be returned to the library! Meanwhile, Emma loves visiting the library and delights in the many adventures to be had in the stories she finds there. When Emma meets Book, they find they are just what each other needs. Together, Book and Emma move out of their comfort zone to try new things, meet new people, and enjoy a few quiet adventures — climbing trees, laughing in the rain, and even cheering along at a soccer match. Along the way, they discover that ‘out there’ needn’t be scary if you just take it one step at a time. Children and parents alike will enjoy this story about being brave, taking risks, and living to tell the tale! “Either as a class or a personal read, this is a wonderful way to have children begin to talk about the things that concern them and help them navigate their way through them so they, like Book, can discover a whole new world of adventures.” – Click here to read in full. “ Often it’s difficult to step out of our comfort zones – hard enough for adults and regularly even more so for children. This is a beautiful book with which to explore overcoming trepidation about new situations.” – Click here to read in full. 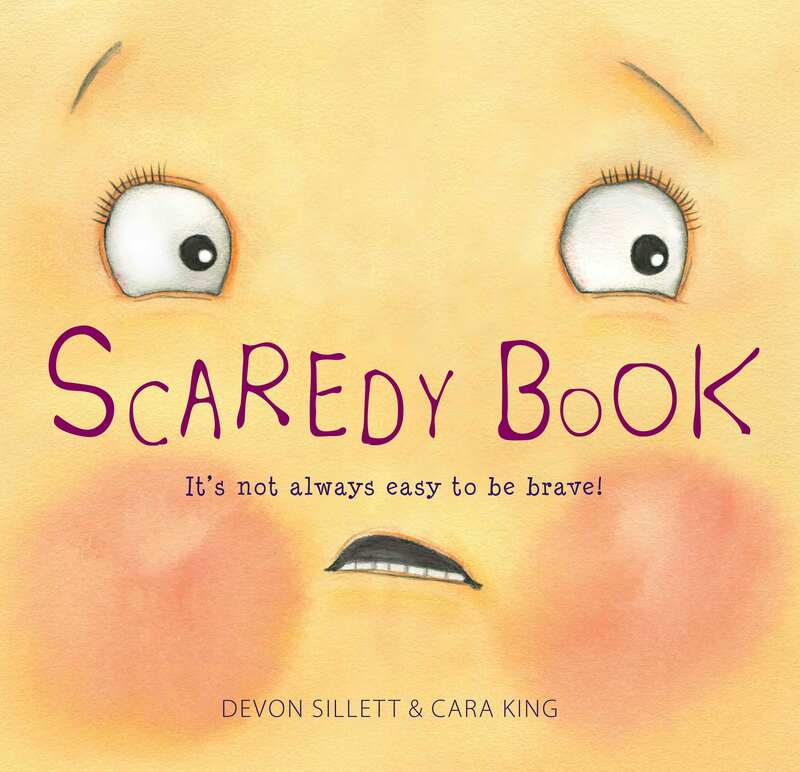 “Scaredy Book is a sweet story with the important message that taking risks and being brave can certainly pay off!” – Click here to read in full. “I loved it and my kids do too – I have a feeling this one will be read a lot over the coming months. Definitely one for the classroom or homeschooling library.” – Click here to read in full. 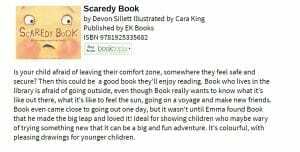 “Children and parents alike will enjoy this story about being brave, taking risks and living to tell the tale!” – Click here to read the review. “Book lives at the library and desperately wants to go outside, but is intimidated by all the things that might happen ‘out there’ .” Click here to read in full. 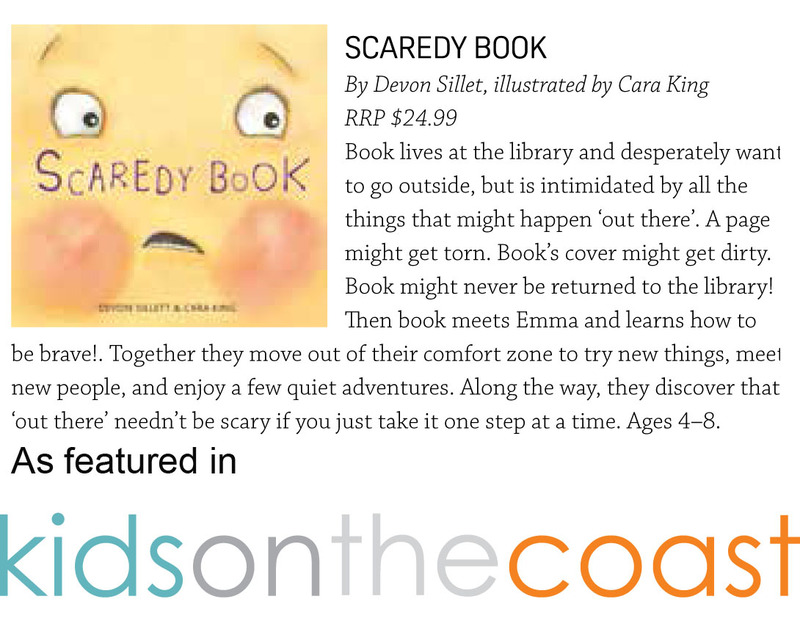 ” Well-crafted and beautifully illustrated Scaredy Book will raise a great many discussion points with children and their parents. As it is set in a library, which in many ways is a great jumping off point for many adventures, it may also encourage young readers to discover the shelves of their libraries and the amazing amount of very safe adventures to be discovered in the pages of a book…” Click here to read in full. 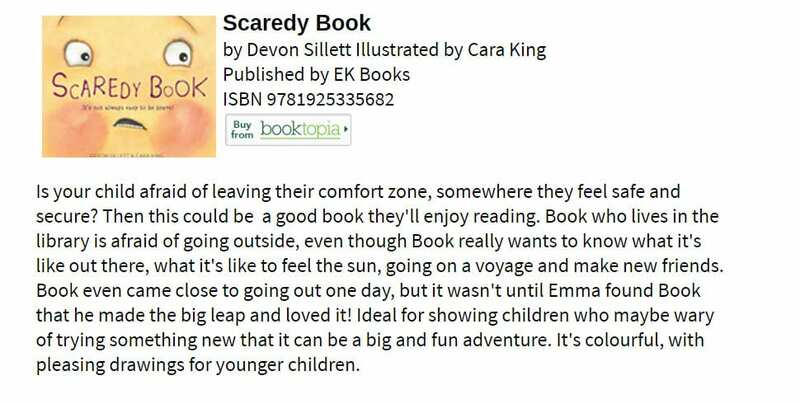 “Author Devon Sillett has an obvious love of books and has translated this love into a delightful way of dealing with being scared…” Click here to read in full. 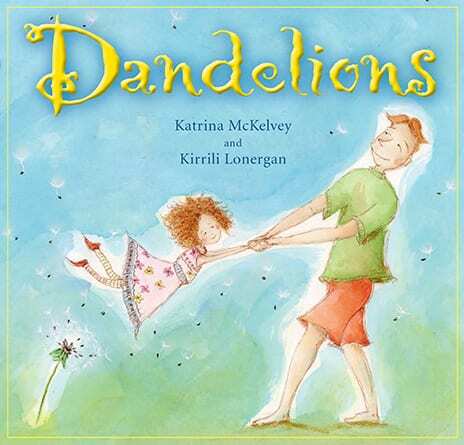 “The children loved (this book) and the librarian told me that several of the little ones have said they are going to take this book out on adventure.” Click here to read in full.